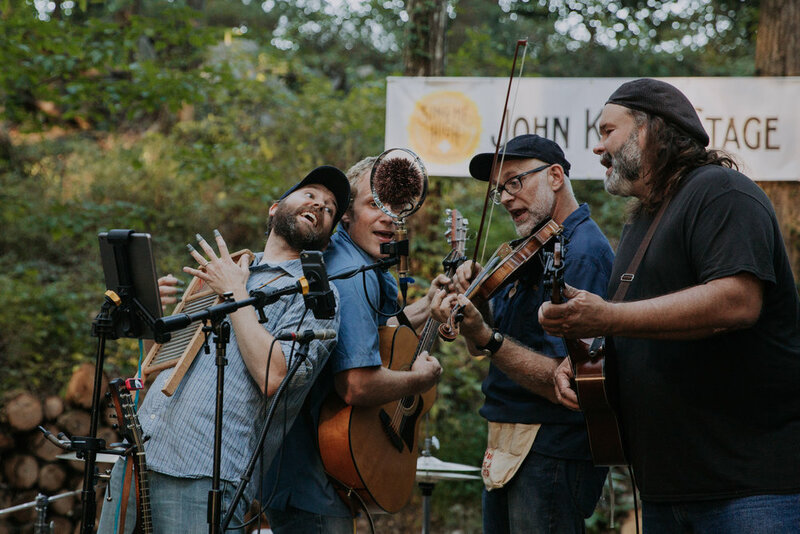 Festival co-hosts the Walking Roots Band are back to celebrate music and faith with their signature style of folksy acoustic string-band music with generous portions of lyricism, harmony, humor, and love -- as well as a few dashes of Appalachian rap thrown in for good measure. With a loyal local following and growing fan-base from pockets throughout the east and Midwest, the Walking Roots Band is sure to delight, entertain, and do the soul good. As a busy comedian performing throughout the United States and Canada, Ryan receives over 500 performance invitations and accepts 175 of these annually. Whether it’s his laugh-crazed family show or his dynamic corporate gigs, there are two things his audiences have come to expect: a flawlessly clean show and sidesplitting comedy! He’s been around too. You may have seen him on the History Channel, performing on Disney Cruise Lines, or at the Mennonite Church USA bi-annual convention. His comedy has taken him to 6 continents, and his largest live performance was for over 52,000 people. Ryan also hosted a ‘Ryan & Friends’ cable TV show. Friends with the Weather, a project from the trio of singer-songwriter/multi-instrumentalists Seth Hendricks, Chris Good, and David Hupp, celebrated it's debut album release & inaugural performance in September 2016. A proud member of the Earthwork Music Collective, Friends with the Weather is a unique blend of dynamic musicianship, 3 part vocal stylings, and rich lyrical content exploring how we can learn & grow in the midst of challenging times, striving to be sources of love, hope, passion & vision. Many within the Church of the Brethren and Mennonite communities will recognize the trio as members of the band, Mutual Kumquat, who performed their finale concert in July 2018 after almost 2 decades of music making and performing, including at many CoB denominational events, churches, and colleges. Honeytown is a fun and upbeat four-piece group of talented musicians from Kidron, Ohio featuring Tim Shue, Nate Gundy, Kevin Himes and Toby Hazlett. The band's eclectic musical mix, original compositions, unexpected arrangements and their tightly-blended harmonies have won them a fan base all over the midwest. Their varied instrumentation ranging from fiddle to banjo, washboard to bass uke, accordion to percussive trash cans takes their audiences by pleasant surprise. Honeytown has performed their unique blend of unpredictable folk Americana, rock and roll and progressive bluegrass for conventions, conferences, weddings, benefits, barbecues, house concerts, coffeehouses, and as the showcased musical guests for the Summit Choral Society's Bluegrass Mass, The World Beloved in Akron, Ohio. They were the featured adult worship band at the National Mennonite Church Convention in Columbus, Ohio in 2009. David Horsey (Pulitzer Prize winning editorial cartoonist and columnist, Seattle Post-Intelligencer) wrote: "Michael Stern's music is an anthem for an America as it should be - a reminder that peace and justice should be our highest moral values." And Maureen Jackson described Michael’s music in Victory Music Review as: "… tender and powerful lyrics …, subjects that matter …, warm voice, beautiful poetry and rich arrangements draw us into the heart of compassion …"
Mike will be joined by Chicago based fiddle player, Louise Brodie. She shares a passion for peace and justice and performs with Mike each summer at the Brethren Song and Story Fest. Louise also performs throughout the Chicago area with the groups Trillium, Briar Road, and the Riverside Ramblers. Since forming in the fall of 2013, Good Company, a six-member a cappella ensemble based in Harrisonburg, has performed regularly in the Shenandoah Valley and beyond. Their debut album, Awake, was released in 2014, and they released a much anticipated Christmas album in December of 2016. With a wide repertoire encompassing everything from early music to contemporary pop arrangements, spirituals to classic 70s rock, and even a few original compositions, Good Company hopes that everybody can find something to enjoy and connect with in the music they share. A staple of the Sing Me High Music Festival, Good Company returns to the stage to delight audiences once again in 2019.